Having trouble connecting to international components or machinery? 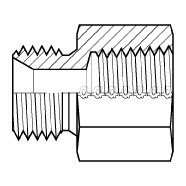 Looking for a quick, economical, and easy solution to change the thread size on any threaded connector? Your search ends here! Our Thread Adapters make size to size thread conversion a breeze. This adapter will convert holes which fit size 1" BSPP male threads to a female 3/4" NPT threaded hub. Our high quality Thread Adapters are used everyday in the Industrial, Commercial, Chemical, Petrochemical, Power, Oil & Gas, Mining, Military, Maritime, and Professional Sound & Light industries among many others. Looking for a different size, material, or connection type? Check out our full offering of Thread Adapters !